Doesn’t that photo make you want to grab a fork? Lordy Mercy, that photo makes me want to eat. I swear I can taste that grilled cheese and nutty rye berries. 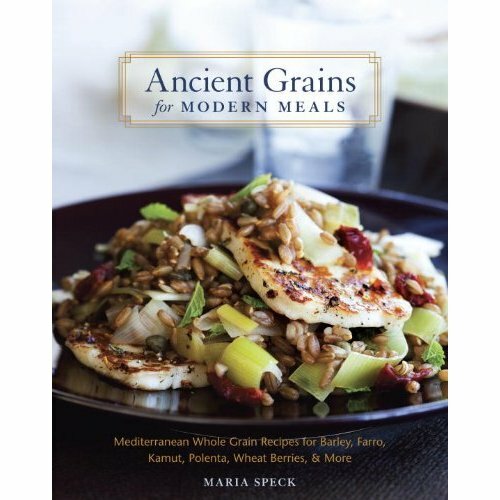 Sara Remington called Ancient Grains for Modern Meals: Mediterranean Whole Grain Recipes for Barley, Farro, Kamut, Polenta, Wheat Berries & More. The title is quite a mouthful, but a good one. We all know we’re “supposed to” eat more whole grains. I know my way around the grain bin pretty well, but even as a professional cook I sometimes face the wall of bulk food at Whole Foods Market with more than a smidgen of bewilderment. Well, my friend, be bewildered no more. This book is the answer. Maria was raised in Germany and Greece – where they’ve had an appreciation for these ancient grains for a long while. Her style of cooking and teaching lends a distinctly European approach to simple yet delicious dishes made with whole grains. Her vast knowledge of the centuries-old traditions of cooking and baking with barley, polenta, quinoa, spelt, and farro shines through in both the text and recipes. She transforms these ancient staples into quick and modern foods for busy lives. I know that for me, it just makes me want to get in the kitchen to cook and eat. I hope you, too, enjoy this sampling of Maria’s book. 15 minutes if you have time. Drain any remaining liquid and transfer to a large serving bowl to cool. 2 While the rye cools, prepare the salad. Bring the leeks, chicken broth, and orange zest to a boil in a large saucepan. Decrease the heat to maintain a simmer, cover, and cook until the leeks are soft, 5 to 7 minutes. Drain the leeks, and add them to the serving bowl with the rye berries. Add the sun-dried tomatoes, 1/4 cup of the mint, and the capers, fennel seeds, salt, and pepper. Taste and adjust the seasoning, keeping in mind that capers and haloumi are quite salty. 3 To finish, position a rack about 6 inches below the heat source and preheat the broiler. Cut the haloumi cheese into thin slices, about 1/4 inch thick, and put them on a plate. Sprinkle with the oregano, pepper, pepper flakes, and reserved 2 teaspoons of tomato oil; rub the oil and spices all over to coat the slices on both sides (work gently, as haloumi breaks easily). Transfer the cheese to a medium cast-iron skillet or a broiler pan. 5 Top the salad with the haloumi. Sprinkle with the remaining 2 tablespoons mint, and serve right away. to get a head start: Make the rye berries, as in step 1, ahead (see page 23). 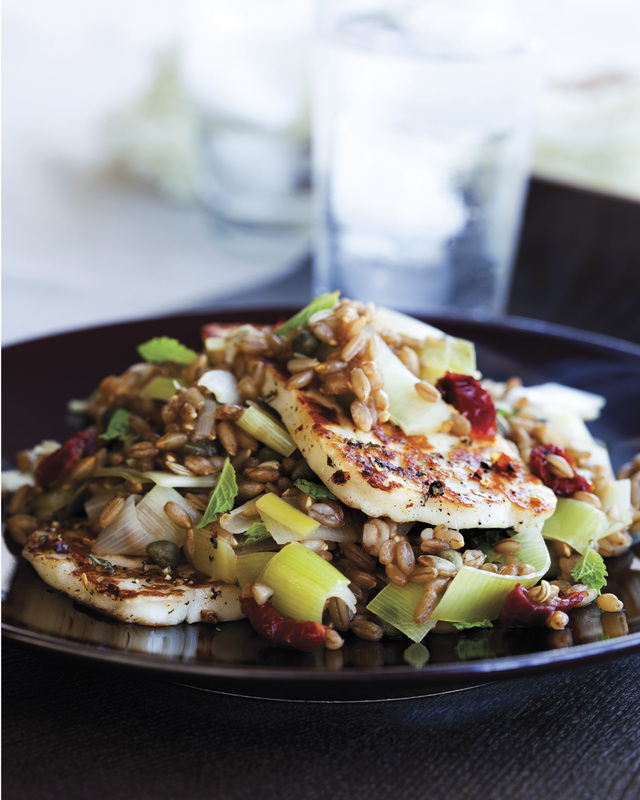 The salad (without the haloumi) can be prepared 4 to 6 hours ahead. Chill, covered. Bring to room temperature before serving. 1 First, make the dough. To prepare the dough by hand: Whisk together the spelt flour, baking powder, salt, and sugar in a large bowl. Make a well in the center. In a small bowl, combine the ricotta, milk, linseed oil, and the egg and beat with a fork until smooth. Pour the ricotta mixture into the well. Combine with a dough whisk (see page 30) or a fork, stirring from the center and gradually incorporating the flour from the sides until a fairly moist dough comes together. To prepare the dough by food processor: Place the spelt flour, baking powder, salt, and sugar in the bowl and process for about 10 seconds. In a small bowl, combine the ricotta, milk, linseed oil, and the egg and beat with a fork until smooth. Pour the ricotta mixture across the top of the flour mixture and pulse, in 1-second intervals, just until a ball forms, 5 to 10 pulses. The dough will be fairly moist. 2 Transfer the dough to a well-floured work surface. Lightly flour your hands and briefly knead 5 to 7 turns to get a smooth yet slightly tacky dough. Wrap the dough in plastic wrap and let sit at room temperature for 30 to 45 minutes to allow the bran in the flour to soften. 3 Meanwhile, place a baking stone on a rack on the bottom shelf and preheat oven to 425°F. Liberally sprinkle a pizza peel with coarse cornmeal. Finely chop the white and light green parts of the green onions until you have 1/2 cup. Combine them with the sour cream, capers, and 1/4 teaspoon of the pepper in a small bowl. Finely chop the dark green parts as well (about 1/4 cup) and set aside for garnish. 4 Unwrap the dough, transfer to a lightly floured work surface and cut into 2 pieces. Keep 1 piece covered with plastic wrap. Lightly flour your hands and briefly knead the other until smooth, 7 to 10 turns. Using a rolling pin, roll the dough into an elongated pizza, 11 by 8 inches and about 1/4 inch thick. Do this in stages, occasionally turning the dough over and rolling it out further, lightly flouring your work surface and the rolling pin each time. Place the dough on the pizza peel. Spread half of the sour cream topping across, leaving a 1/2-inch border. 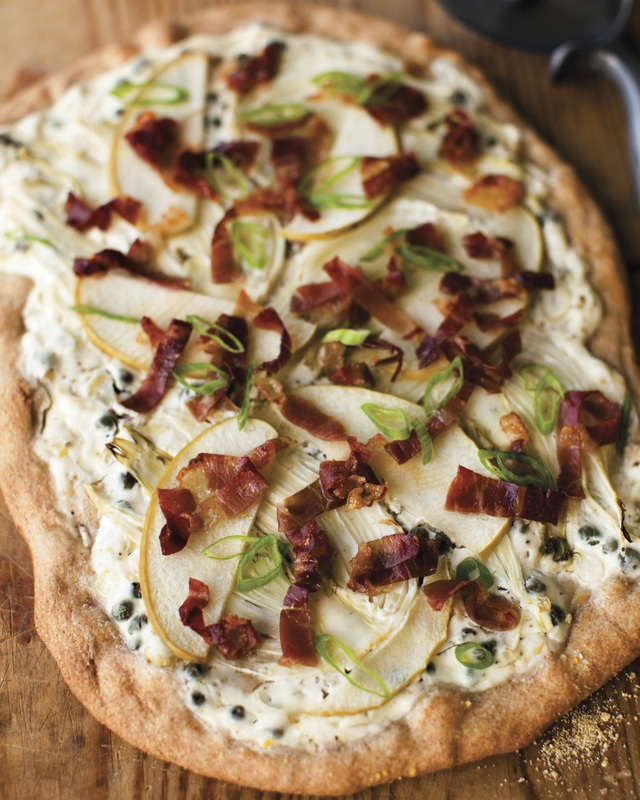 Cover with half of the apple slices, top with half of the fennel slices, and sprinkle with half of the prosciutto. Brush the border with oil. 5 Slide the dough onto the baking stone and bake until the fennel just starts to brown at the edges and the rim turns golden brown and starts to crisp—it should yield when pressed with a finger—about 15 minutes. Use a large spatula to lift the edges of the pizza so you can slide the peel underneath; carefully transfer the pizza to a wooden board. Sprinkle with half of the reserved green onions and 1/4 teaspoon of the pepper. Cut with a sharp knife and serve at once. Repeat with the second pizza. to get a head start: The dough, as in steps 1 and 2, can be prepared 1 day ahead. Chill, wrapped in plastic wrap. Remove the dough from the fridge and unwrap; flatten it slightly, and allow to come room temperature while you prep the ingredients and preheat the oven, about 1 hour. to lighten it up: Feel free to use part-skim ricotta, lowfat milk, and lowfat sour cream, but do not use nonfat. 1 To make the polenta crust, bring the broth and the water to a boil in a large heavy-bottomed saucepan over medium-high heat. Add the salt. Using a large whisk, slowly add the polenta in a thin stream, and continue whisking for 30 more seconds. Decrease the heat to low and cover. Cook for 10 minutes, stirring vigorously with a wooden spoon about every 2 minutes to keep the polenta from sticking to the bottom. Remove the saucepan from the heat and let sit, covered, for 10 minutes, stirring a few times. The polenta will be fairly stiff. Stir in the cheese, egg, and pepper. 2 Grease a 10-inch ceramic tart pan with olive oil or coat with cooking spray, and place on a wire rack. Have ready a tall glass of cold water. Dip a wooden spoon into the water as needed as you spread the polenta mixture across the center of the pan, pushing it up the sides. Set aside to firm up at room temperature, about 15 minutes, and then form an even rim about 3/4 inch thick with your slightly moist fingers, pressing firmly. No need to fret over this—it’s easy. 3 Meanwhile, position a rack in the center of the oven and preheat to 375°F. 4 Prepare the artichoke cheese filling. Place the yogurt, eggs, green onions, parsley, rosemary, salt, and pepper in a 2-cup liquid measure or a medium bowl and combine well with a fork. Distribute the artichoke quarters over the crust, cut sides up, forming a circle along the rim and filling the center (you might not need all the hearts). Sprinkle the goat cheese on top and gently pour the filling over the artichokes. Sprinkle with the Parmesan cheese. 5 Bake the tart until the top turns golden brown and the filling is set, about 45 minutes. Transfer the pan to a wire rack and set aside at room temperature to firm up for at least 20 minutes, 40 if you can wait. Using a sharp serrated knife, cut into slices. Serve with more freshly ground pepper on top if you like. 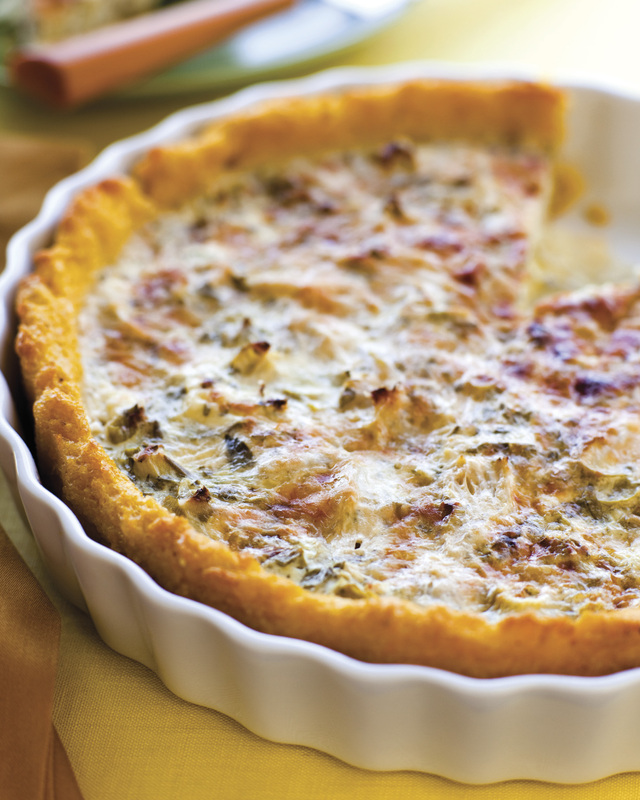 to get a head start: The polenta crust, as in steps 1 and 2, can be prepared 1 day ahead, as can the entire tart. Cool to room temperature, chill for a couple of hours, and then cover with plastic wrap. Allow the tart to come to room temperature before serving, or gently reheat to warm (not hot) in a 325ºF oven for about 20 minutes. to lighten it up: Use 1 cup non- or lowfat Greek yogurt in the filling instead of whole-milk yogurt.